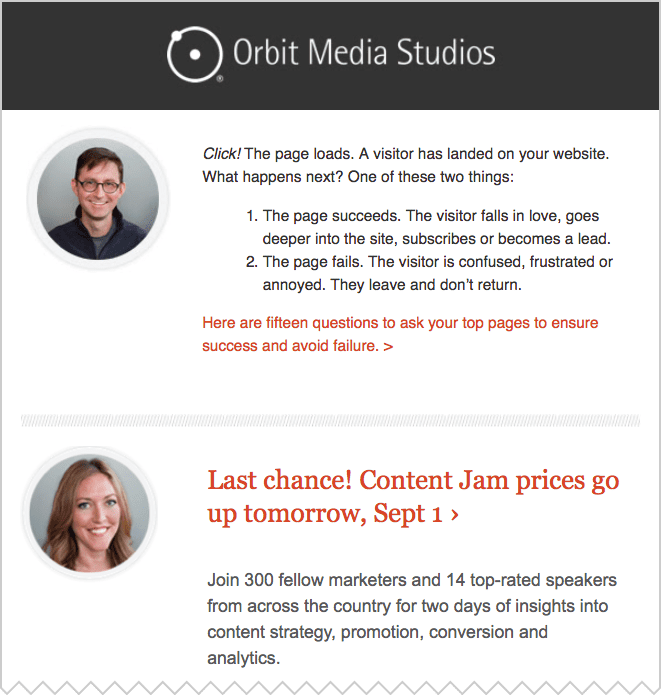 All content marketers have one common goal: capture their visitors’ email addresses. Visit any major blog or media website and you’ll see email signup forms pop up, slide in and drop down. You’ll see them right when you land and right as you’re leaving. Why are brands so eager to collect your email address? It’s because email is the only direct connection they have to their audience. With search and social, there is a company between you and your audience. Google and Facebook are intermediaries. They stand between you and your visitor. With email, there is no company in the middle. You do not own your social followers or your search rankings. But you own your email list. So one of your main goals is to build a loyal audience of subscribers. Every serious content marketing plan is focused on email list growth. Email reports appear in two places. First in your ESP (email service provider), and then in Google Analytics. The ESP reports open and click through rates. Google Analytics reports on what the visitor did after they clicked on the email and landed on your website. You’ll need both to get the complete picture. As with all reporting in digital marketing, the reports from your ESP are never 100% accurate. The tracking of emails is a little bit strange. 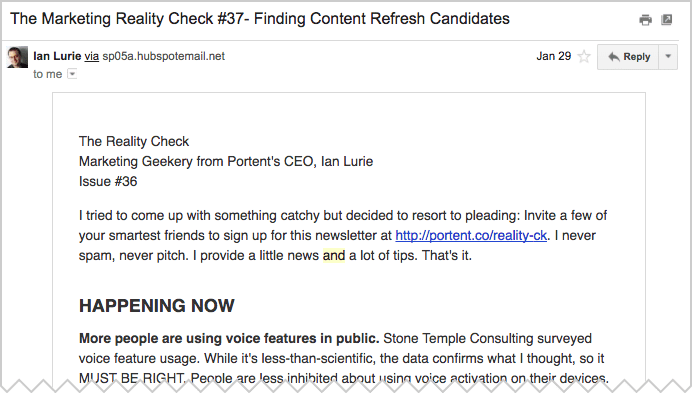 To track open rates, ESPs add a tiny invisible pixel to every email. If this pixel loads, they know the email was opened. But some subscribers may have images turned off, so their open is never recorded. Other subscribers may open the email from several locations, so their opens are recorded multiple times. The goal is not to have perfect data. The goal is useful insights. We only need information accurate enough to guide our next decision. Open rates are an imperfect metric, but it’s all we got. So how can a marketer increase open rates? What are the key factors in email open rates? Let’s break down the message itself. Here are the five success factors of email messages that drive traffic. The first three are the major factors in open rates. The last two are the major factors in click through rates. Of course, traffic from email depends on the open rates and clicks! Since most email is opened on mobile devices, we’ll start there. Here’s what the preview looks like in your subscribers’ mobile inbox. You can already imagine how the sender name, subject line and preheader increase email open rates. They indicate the benefits of spending a bit of time with the message. It’s the most prominent part of the email preview, so it’s a huge factor in open rates. This is your first chance to trigger trust. Marketers may forget to check it, but recipients never forget to look. Send from a person, not a brand. The sender name isn’t the same as the “from” address, so never use an email address. Don’t make “sclark@zippycpa.com” your sender name. And “Do Not Reply” just isn’t a friendly name to call yourself. The sender name is easy to change from within your email service provider. Your ESPs may even make it easy to A/B test different sender names. You’ll quickly discover if a more human sender name affects open rates. “Ye olde bait ‘n switch! Don’t ever try to deceive subscribers into opening your email with a dubious or bait-and-switch subject line. Keep in mind, your subject line doesn’t have to be the same as the title tag or headline of the article. Subject lines have nothing to do with SEO, so there’s no need to include a target keyphrase. Tailor it for the inbox. It’s strictly about empathy and psychology. Be unexpected, helpful, provocative—or all three! Screens are small and mobile inboxes are cramped. The first five words might be all that your subscriber will see. Be sure to get the important words and phrases into the beginning of your email subject line. Numerals stand out against letters in lines of text. So unless they’re spelled out with letters, numbers add visual prominence. Those numeric characters can make an email subject line a bit more prominent in the recipient’s inbox. And odd numbers seem to work best …does anyone have research on this? Or an explanation? Please let us know in the comments! Warning! Avoid words that may indicate spam. Some words may actually reduce the delivery rates of email because they can sometimes trigger the spam filters. Avoid using these words: raffle, rewards, coupon, discount, savings and offer. 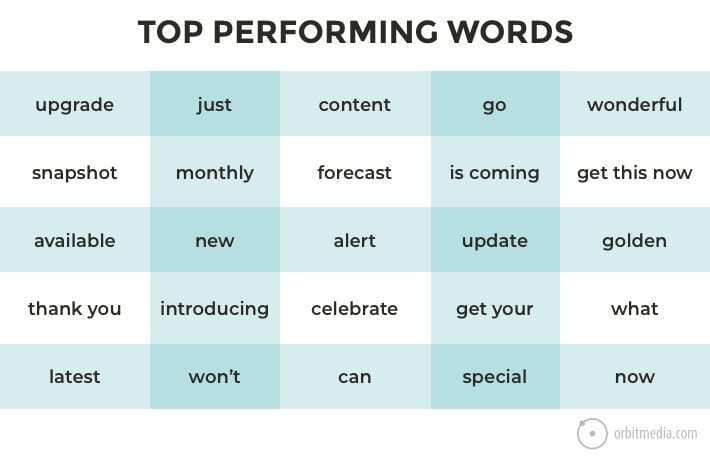 They are statistically among the worst-performing words in email marketing. Maybe yes! The research shows that subject lines of all different lengths can be effective, but there might be a sweet spot. 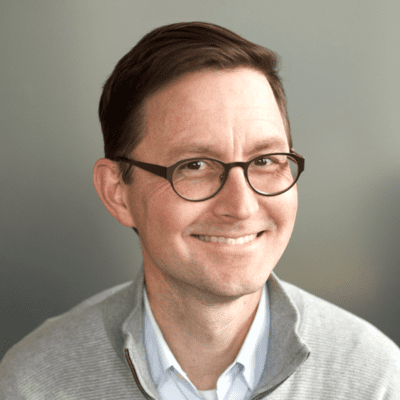 Mike Madden of Marketo analyzed hundreds of thousands of emails and found short works a bit better. Seven-word headlines performed best. In his dataset, the average seven-word headline had 41 characters, but who’s counting! source: Marketo: What Email Subject Line Length Works Best? Also, read Databox’s study on how to write engaging email subject lines based on 28 case studies. What’s the most common question people ask you? Or ask your sales team? Or your customer service team? Think about whatever question people ask you most often. Try using that exact question as your next email subject line. Your next great subject line is waiting for you in your email inbox or chat logs. What was your top performing post on social media? Look at your social media analytics. Whichever post had the best engagement in social will probably work great as an email subject line. Your next great subject line is waiting for you in Facebook Insights. The third and final element in the email preview is the preheader text. This is either the first words from the email message or a tiny bit of text at the top of your email template. It’s visible in the inbox so you can use it as another way to indicate the benefits of reading and increase email open rates. Here’s what a preheader looks like in Gmail. Send a test email message to yourself. Look at it in your inbox. Don’t open the email. Just look at the message and ask yourself: Is the preheader meaningful? Descriptive? Interesting? Is it getting truncated Would you click on this? These bits of text are sometimes added automatically to emails by email service providers. None of them convey value to subscribers or help your open rates. Remove them, change them or pick a template that doesn’t have them at the top! The next two aspects of your email determine the click through rate and traffic. The design of emails is as varied as the design of web pages. Some emails are visual; others are plain text. Some are focused on promoting a single article; others are a digest-format with multiple links. Long or short, fancy or simple, measure the success of your emails based on the click through rate to your website. Warning! Links to other websites, to social media networks or to email addresses may get clicks but not drive traffic. These clicks might be one of your goals (simple awareness of your brand) but not others (traffic and conversions). Be cautious and deliberate when linking to anything but your site from your emails. An email inbox is a crowded, competitive place. Your subscriber is doing a split-second cost-benefit calculation before deciding to click. The design and writing of the email is critical. You are at a disadvantage if the email looks like an ad, if it’s a big flashy graphic, if it’s nothing but dense blocks of text. Mobile open rates vary across industries. B2B subscribers may be more likely to subscribe using a work address and open emails on a laptop in the office. But everyone has access to email everywhere. Since sometime in 2014, most emails are opened on mobile devices. Test your emails on your phone. The text should be easy to read, left-aligned and it should wrap nicely. The email should load fast. The design should look good, even when images are turned off…which is something else you should test. Every inbox is a mix of personal and marketing messages. So every recipient is subconsciously filtering emails from people and emails from companies. To keep your emails from going in the company bucket (which is one step away from the trash bucket) write them in a personal tone. Take a look at this first paragraph. It’s a request to refer your friends to his list, but it’s in Ian’s humble, unmistakable voice. I can almost hear him saying it. Write something that sounds like you’re saying it. Just as web pages have a better chance to connect if they use pictures of people, try using pictures of authors or collaborators in your emails. This is another way to humanize your content. They’re great for emails but also for landing pages, social media profiles, homepages, contact pages and everywhere else. I can’t think of a bad place to put a friendly mug. Even if your email is promoting just one article, give the subscriber a few different places to click. Anything that triggers their interest should be clickable. That might be a headline, an image or a few words within a paragraph of text. Ok, we don’t normally recommend making the unsubscribe button this prominent, but Chris has done something so special, it’s worth mentioning. It’s at the top. it’s colorful. it’s even animated. You can’t miss it. Chris must have a nice, clean list! If the goal is to drive traffic, it doesn’t make sense to put the entire article in the email. The email is really just a teaser for something on your website, an invitation to visit. If you put the entire piece in the email, the subscriber doesn’t have to click at all. They may read it, love it and delete it. Tip! Everyone loves beautiful design. But it’s worth experimenting with sending plain text emails—and comparing the click through rates. The headline may link to your article, but you also need a call to action and the end of the email or after the teaser text for each article. And “Click here” and “Read more” are not calls to action. A good call to action uses all the principles of conversion: it draws attention, indicates a benefit and uses a strong verb. Which of these is more likely to win the click? And mobile-friendliness for your CTAs is mandatory. Email CTAs must be large and tap-able for fingers of all sizes. Research by the MIT Touch Lab shows that the average index finger is 45 x 57 pixels for most screen resolutions. Thumbs are a bit bigger. 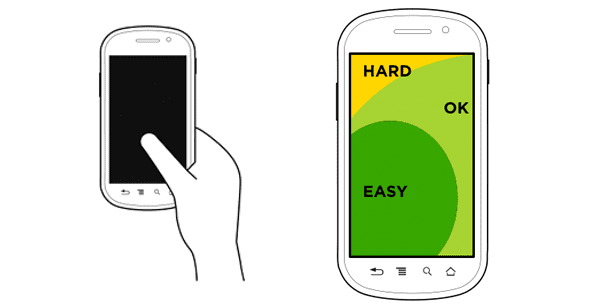 If you expect people to use their thumbs to tap your button, make it wider: 45 x 72 pixels. For mobile-friendly emails (and web pages) make sure that calls to action are low and centered. Some areas are right under the visitor’s thumb. Others are harder to reach. Some subscribers will have images turned off. This creates a problem if your calls to action are image-based buttons, rather than text-based links. But there is a way to design a link to look like a button using a bit of HTML and CSS code. Email marketers call this the “bulletproof button” because it always displays, even when images are off. Here are the other key success factors in email open rates and click through rates. If they aren’t expecting it or didn’t ask for it. They’re unlikely to open or click. Expect low open rates and high unsubscribe and spam complaint rates! Time of day and day of week will partly determine how engaged the recipients are, so test various times, including weekends. This is always a factor, so use an email service provider (ESP) that gets 99% of your messages through! Sales messages tend to have lower open rates. Your welcome series emails typically have the highest open rates. The program and the benefit to the subscriber is the final key factor. I think this post could use a few more examples. If you have a favorite newsletter, please let us know with a comment. We are always, always looking for great content. Thank you! Thank you for this informative blog post. The quality, not the quantity, of the list and maximum 1 newsletter per month make me have an open rate of + 80%. My best time to send newsletters is strange enough on Sunday evening. * Too many exclamation points in the body of the email—and don’t put any in the subject line. * Colors in the body of the email. We do this to break up chunks of text (and stay on brand) and it won’t pass some spam filters. Total bummer. * Images being turned off definitely is a big one. Because of that, we stopped using them. But you have photos of your authors in yours (and mention it above). Do you not see an issue with this? We haven’t seen any issues putting our mugs in our email. Although, I’ve never tested it! Maybe I should. Have fun and good luck in San Diego! Images are off for 25% of inboxes in general (higher for B2B or where Outlook/Android are prevalent), but they can still serve a purpose! As long as your message still comes through with them off, they can do wonders when turned on. Amazing details as always Andy. I really appreciate you taking the mobile perspective on this. I’m with Gini – time to tweak our email approach! One of the most useful reviews I’ve read in a long time – in fact, probably the only one in ages that I read right to the end! Great reminders and also peppered with new insights. I will be sharing! Personal sender name perspective from email reader. If from the same person each email, that builds trust. But when the name changes with every email, that causes suspicion. MusiciansFriend does that every day, apparently in attempt to trick me into opening. I’m an old, satisfied, MusiciansFriend customer. I bought by mail-order before there was an internet, when they mailed catalogs. Email readers are not static. Current priorities change. Right now I need and appreciate anything from Andy. If MusiciansFriend doesn’t alienate me too much, I’ll open their emails in the future, and buy again. Rather than remove me from their list, maybe they should slow down to once a week or once a month. I might open if I heard from Susan Clark once in a while. I wonder if the odd numbers attraction could somehow be connected to the art/design rule were sets of odd numbers (3,5,9) are more interesting to the eye than even? Among favorite newsletters, Seth Godin is quite unique although many principles you’ve mentioned not met at all, but he did quite a great job in the beginning, so the pure content itself makes one look forward to receive the newsletter. Another that I’m very fond of is The Content Advisory by Robert Rose, great one, good design and great content. The other one is definitely Orbitmedia. – Use personal selling, i.e. Hi, I’m Jess! How can I help you buy a home or learn more about our university? – Are of a size that the founder is still as well known as the company name, i.e. John, the owner of the restaurant or Jenny, the well-known speaker that shares insights as part of her gig at the business-to-business services company. – Personal service/customer service, i.e. an account rep (sales or service) that already sends other emails to this prospect. That can actually help your emails get through to the recipient’s inbox more often since the recipient is opening/replying to other emails from that person! – No one knows Mary in Marketing and the From Name being unknown is one of the reasons that people delete an email without reading it! – Worse: it comes ‘from’ the CEO of Big Corp and everyone knows they didn’t really send it. Love you guys, love your show 🙂 Keep up the fab posts! We always show a link to something “brunchy” I don’t write a news letter – I prep the brunch. I don’t add mages and video – I do garnishee work and it’s in the oven when it’s deployed. Really excellent piece, Andy! Loved the detail and the data-supported evidence. Regarding the human psychology around even and odd numbers. Within the context of sharing “findings”, “tips”, “recommendations”, “ideas” etc. “3” and “5” are viewed as more complete than “2”, “4” or “6” which, psychologically, feels like there is something lacking or missing. After “5”, groupings in increments of “5” covey completeness (Top 10, 15, 20, etc.). Hope that helps! Thanks for these useful tips, Andy. One thing I’ve found great results with is personalization that goes beyond using their name, personalizing the message based on their current situation and what’s directly relevant to them at that point in time. This works really well as part of an onboarding process. As an example, when people sign up to use optinopoli.com, there are 3 main steps they need to complete. For each step, until it’s completed, they receive targeted messaging with more information about how to do so, just basically helping them through the process. For example, it’s easy for people to get distracted or perhaps not be too clear on what to do next. The emails help them through. On these messages, because they’re highly targeted and relevant, ‘personalized’ to the level of progress the person has made, open rates are much higher than usual, opt outs much lower, and general engagement higher too (e.g. replies back).